The accomodation facilities are in an ideal area to people who travel for work or tourism. It’s very near to Cagliari Port, the railway station and the bus station Arst. Located in the central Trieste Avenue, the room rental Un Letto a Casteddu provides to the customers comfort and suitability. The accomodation facilities are in an ideal area to people who travel for work or tourism. It’s very near to Cagliari Port, the railway station and the bus station Arst. 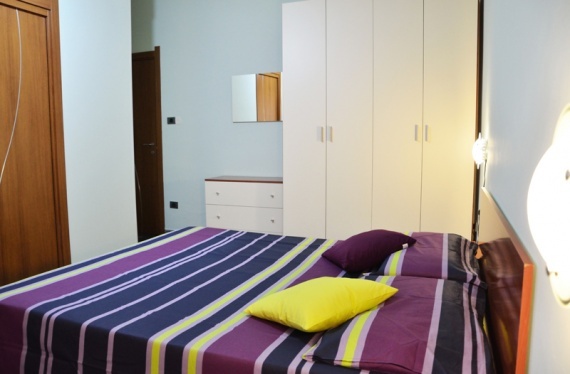 The B&B is easily accessibile also to people who come to Cagliari by car or by taxi, because it is located at the town entry. In the nearest Matteotti Square you can find all the main means of tran sport that allow you to reach every place in the town. You can reach all the main banks by foot. Nearby there are lots of restaurants, nightclubs and shopping streets. In the area there are the main regional and provincial agencies offices and this fact makes the area really quiet and safe. The homely flat, recently renovated, is provided with bright rooms, with view to the Avenue. All the rooms are provided with private bathroom. The young owner, Michele, is a reliable reference point to his customers, because of his kindness and helpfulness in giving information. The B&B is imbued with its classical atmosphere, making customers feel comfortable, they feel guests and not only customers. They can also taste typical products of Medio Campidano unpolluted countryside, own production, such as myrtle liquor and extra virgin oil live.